Danny Rogers, Guilford County's new sheriff. Seven new African-American sheriffs were voted into office in the November midterms, and among them is Danny Rogers. On Monday, Dec. 3 Rogers became the first African-American at the helm of the Guilford County Sheriff’s Office. Host Frank Stasio speaks with Guilford County's new Sheriff Danny Rogers. Rogers ran on a platform of positive change for all residents of Guilford County and ousted BJ Barnes who had served in the position for 24 years. Rogers’ stated goals included building trust, prioritizing effective community policing efforts and increasing morale. The latter is raising eyebrows as Rogers first announcement was his plan to cut more than two dozen employees. Earlier this month he brought together law enforcement officials from around the Triad for a press conference in which he spoke out against gun violence and asked community members to be proactive if they have information on open cases. 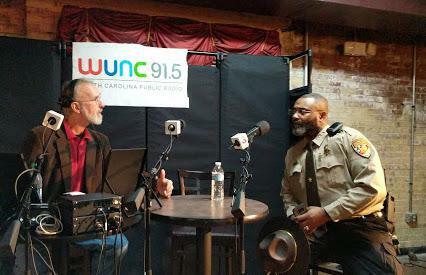 Rogers joins host Frank Stasio live from Triad Stage in Greensboro to share his plans for Guilford County. I think people got a chance to learn … Who I am. I campaigned on transparency. I campaigned on being real. I campaigned on life experiences. What we have to do as a law enforcement agency is … prepare our men and women to be able to deal with people of different cultures. Meet them where they’re at. Learn from them. And make sure we are able to take the tools that they have in the community and bring them into our toolboxes. And take our toolboxes out into the community, so we can work together. Newly elected Guilford County Sheriff Danny Rogers drops by Triad Stage for an interview with Frank Stasio. If a taillight is out, the person needs to be told their taillight is out. Once the person has been stopped for the taillight … and we’ve given them the warning … Then we’ll go from there. We’re not out looking for your tag light being out. I don’t believe the citizens of Guilford County would want us to spend $17 million for an old building when we can get a new building for maybe the same amount or maybe less. When I went to the black community, the issues were always improper arrests [and] abusiveness. When I went to undocumented communities, it was … [people saying:] we are documented, but we’re still getting harrassed. When I went to white communities, [they said:] there’s no one giving us an ear or really helping us out with the opioid epidemic. The summer of 1998 was bright for Teresa Raquel Robinson Freeman, Shamieka Rhinehart, Camille Banks-Prince, and Keisha Wright Hill. They had each enrolled in law school at North Carolina Central University, and little did they know their paths were about to intersect in a way that would make them life-long friends. Affectionately calling themselves “The Golden Girls” after the popular 90s sitcom, these four women of color would endure break-ups, break downs and even death on a path that no one anticipated. That was 20 years ago. Today each is a judge. After noticing that most of the black voices featured in the news come from the educated and affluent, Kevin “Kaze” Thomas and Karim “Bishop Omega” Jarrett made it their mission to represent the perspectives of everyday black people. They do this through their weekly web series “Intelligently Ratchet,” which streams live on Facebook every Wednesday at 9 p.m. There is a common misconception that black people do not hike, camp or spend much time in the outdoors. This perception is perpetuated by images featured in nature magazines and fitness Instagram accounts that still predominantly feature white individuals and families.